If you follow me on facebook you have already read that I am writing a children’s book. I am so excited about this adventure. This week I have been working on illustrations and so far they are turning out great. My dilemma is whether to make them line drawings or water colors, but I’m leaning toward water colors. I illustrated a book in the early 1990s with line drawing but that was the publisher’s request. The book was called “What Can Little Fish Do?” by Devora Landing. We were both living in Northern Virginia at the time we met. I cannot remember how we met; grocery store, art supply store, book store, but we met without a mutual friend or introduction. That was in the late 1980s and when the book was finally published in 1994, she sent me a copy. The book is basically about a mom fish who teaches her babies to form shapes (circles, triangles, etc) to band together and stay safe. My book is about the life of a Snowy Plover. Yes there is sweetness, yes there is drama, and always a happy ending. My goal is to teach children about Snowys and other shorebirds, how precious they are and about conservation. I’m working on a series and the Snowys are the debut. If a publisher doesn’t pick this up, I’ll put it on Kindle for Kids and CreateSpace for a printed version. Being the publisher I can pick my illustration style. I guess we’ll see when it is published. The Caspian Tern is the largest Tern in the world. In the Western Hemisphere it usually winters in Central America, migrates throughout the eastern part of the United States and nests along beaches as far north as Oregon and Canada. A rare breeder in Florida, where is spends a lot of time, it has been found to scrape out nests near small tufts of beach grass and shells, lay eggs that are buff color and lightly spotted and raise young. These are found near Tampa. According to the Cornell Lab of Ornithology website, www.allaboutbirds.com, the Caspian Tern is on the Least Concern list for bird conservation meaning it is not endangered, just being watched.. However, people need to be aware of these and other shorebirds to avoid them ending up on the endangered list. Many beach goers feel that they are free to use any part of the beach and that the nesting areas are an annoyance. They don’t feel that, by hanging out near the ropes that surround a nesting bird area, they are doing anything wrong. Many people don’t believe birds are that important to the eco-system. If you set up on the beach near a roped nesting area, birds of prey (larger birds, fish crows, eagles) are attracted because they are looking for food. People on the beach means there will be food thrown around for these birds of prey to grab and fight over. Meanwhile, chances are great they flying bird will spot a nesting bird sitting on its nest. Feeling threatened, the nesting bird flees leaving either the eggs or the chicks vulnerable to the prey. Caspian Terns are aggressive birds not to be messed with. It has been documented that Caspian Terns have attacked people on the head, who have come too close to their nesting grounds. It is wise to give these and other nesting shorebirds their space. The beach is large enough for everyone. 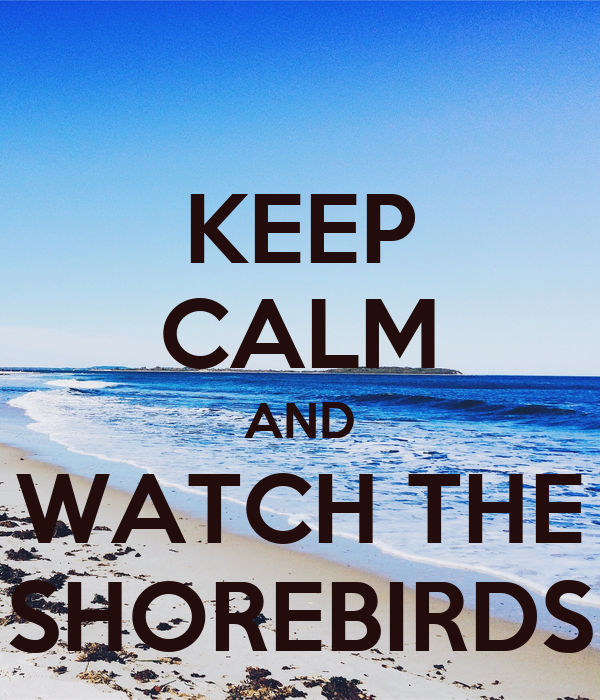 If you’d like to help out the organizations that educate people, raising awareness of nesting shorebirds, you can donate to this organization, Save the Chicks, by clicking the button on the Donate page. Or, by purchasing a set of Caspian Tern notecards from Crafty Beachcomber on Etsy. Each set of four different photos are attached to blank, ivory cards suitable for framing. There is a limited edition of 100 of these numbered sets. The photos are above. Proceeds from the sales of the limited edition card set will be given to an group that works hard to educate beach goers about what the roped areas mean, the importance of birds to the eco-system and other crucial. Subscribe to this blog, on the button to right on this page, for more information about the group we pick as financial beneficiary this year. Small and lightweight, the Red Knot is a migrating shorebird that travels the world over 18,000 miles per year. This species of sandpiper is under consideration by the U.S. Federal government for its protection status, currently “Least Concern”, to be changed to “Threatened”. The Red Knot is vulnerable to over exploitation of shellfish, and the disturbance of habitat by tourism and recreational activities on the beaches. These activities reduce its nesting grounds, non-breeding habitat and food supply. Breeding grounds for the Red Knot are in the Canadian and Russian Arctic, and Greenland. They breed in solitary pairs and make their nests, an open shallow depression, on small areas of vegetation surrounded by mud and water or on stoney ground or open vegetated ground. Food at the breeding location is not plentiful and consists of small insects, spiders, small crustaceans, snails and worms. Until insects are readily available, Red Knots also feed on vegetation. Because of the scarcity of food, Red Knots must gorge themselves along the migration trail, stopping at the Delaware Bay to feast on spawning Horseshoe Crab’s eggs. Here, Red Knots will double their weight during this feeding frenzy of roughly 10-14 days, to head north. Between June and August, solitary pairs will make their nest, usually about ¾ mile apart from each other, and maintain their territories. The nests are sometimes lined with dried leaves, grasses and lichens. The female usually lays four eggs that are olive in color with brown spots. The chicks leave the nest quickly learning to fly and make their migratory trip south. Non-breeding grounds can include the northern Gulf Coast of the U.S., the southern coast of California and northern coast of Mexico. They are found also wintering in Massachusettes. But uniquely, these migrators travel to Tierra del Fuego at the southern tip of South America during our North American winter and then back to their northern breeding grounds for the short breeding period. During the non-breeding season, Red Knots will feast on intertidal invertebrates such as molluscs, crustaceans, insects, and sometimes fish and seeds. The breeding Red Knot is a beautiful bird. It is usually a grey and white blending in with other shorebirds but turning a lovely russet color on its head and breast during breeding season. Since the 1980s, the decline of the Horseshoe Crab in the Delaware Bay has contributed to the decline of the Red Knot. The Horseshoe Crab takes 9-11 years to mature, and finally at the end of May into early June each year, the female can lay as many as 80,000 eggs. The crabs can live about 16-17 years. Horseshoe crabs are often used as bait for fisherman, causing a decline in mature, egg-laying crabs. Red Knots need this source of food for their life cycle. Legislatures of Delaware, New Jersy and Maryland have done what they can to protect the Red Knot but not enough. Now the Federal government is getting involved and is asking for opinions. You can state yours by going to http://www.regulations.gov. The docket number is FWS-R5-ES-2013-0097. Why are these birds important? Birds in general are an important part of our global ecosystem. On various levels of the food chain, they are predators, consumers and the consumed. They provide host habitat for insects and help in the plant pollination process. Our feathered friends are also part of the global economy as birding promotes tourism and industry that produces bird watching supplies. Please support Red Knots by stating that they should be protected with a “threatened” status. Although the government is currently shut down, the website is accepting opinions through the end of November 2013. Thanks for your support.